Director of Vardann hospital, 3D laparoscopy and IVF center, Mumbai. Honorary Endoscopic surgeo- At Wadia hospital (Parel), Railway hospital (Byculla), Umrao hospital and Tunga hospital (Mira Road). Visiting Endoscopy Surgeon and diagnostician – at various hospitals in Mumbai, Thane and Navi Mumbai. 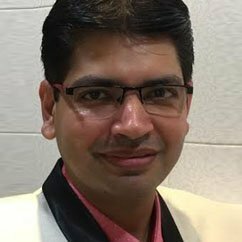 Dr. Nitin shah is a consultant Gynaecologic Endoscopic Surgeon and IVF specialist. He did his Masters in Obstetrics and Gynaecology from Seth G.S. Medical College and King Edward Memorial (KEM) hospital, Parel, Mumbai. He later got a specific training and holds a Diploma in Gynaecologic Endoscopic Surgeries from University of Kiel and Giessen School of Endoscopic Surgery, Germany. He also is certified in IVF & ICSI (Test Tube Baby) from Assuta hospital, Tel Aviv, Israel. He holds training courses for aspirants for Gynaecologic Endoscopic Surgery.